DSC03307, originally uploaded by evanfell. 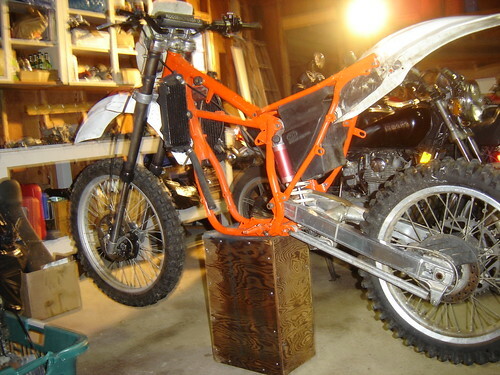 This is a KTM 500mx bike I picked up as a project off of Craigslist. I have a bit of an obsession with KTM 2-stroke motorcycles. These bikes were known to be absolute beasts. In terms of power they put the competing big bore bikes of the time to shame. The KX500 and the CR500 just did not produce as much peak power as these KTM’s. This bike had been torn down when the head gasket blew – a fairly common problem with these bikes due to their insane compression. I got it from the previous owner almost exactly as shown. He had already resprayed the frame and polished up a few bits here and there. Still lots of work to do though. I have a 1989 ktm 500 and I am working on fixing it up, I need the left side out side case over the clutch and water pump. If you can help get that part let me know please. Hi Josh, I happen to have a nearly complete ’89 500 MXC that I need to find a home for. The case covers are in good condition. It came with a few accessories made by Z-racing of Orange County, California. Do you know where I could begin to find a spark arrestor for a 1988 ktm 500?